Hazlet Guests Love Hotel's Jersey Shore LocationWelcome to the Holiday Inn Hazlet hotel, your home base in the Bayshore region of New Jersey. Well appointed to satisfy the needs of Jersey Shore vacationers and business travelers alike, this Hazlet hotel's pristine accommodations and hospitable staff ensure an unmatched travel experience.If you're seeking hotels in Hazlet, NJ for your next family trip, this one is the perfect pick. 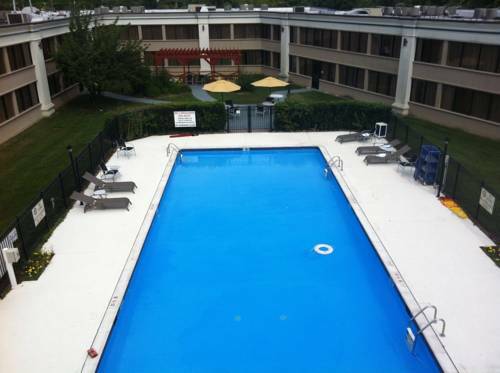 Located three miles from Jersey Shore beaches, 15 minutes from Keansburg Amusement Park and minutes from Monmouth Mall, this hotel ensures easy access to your favorite destinations. With PNC Bank Arts Center nearby, guests can make it to big-name concerts in minutes, as well.Also a great option for business guests, the hotel's facilities in Hazlet, NJ can accommodate corporate gatherings and meetings. The 11 function rooms span more than 9,000 sq ft and include an elegant ballroom suitable for receptions of up to 450. Commutes to businesses like Vonage, AT&T, iCIMS and IFF are a breeze. The Addison Park and Lake Side Manor event facilities are within five minutes.This pet-friendly hotel has everything you need for a fantastic stay, from free wired and Wi-Fi access and 24-hour Business and Fitness Centers to the seasonal outdoor pool. Dining at our Bayshore Grill is always a pleasure, and you don't want to miss happy hour at Bayshore Bar. Start preparing for your visit today; we're waiting to welcome you. Ground Level with dedicated access from outside. Large Pre-function area. Tastefully decorated in neutral colors with versatile lighting. Tastefully decorated in neutral colors with versatile lighting. Children's program - On-site Seasonal outdoor pool & courtyard. - Six Flags Great Adventures Amusement Park.